This medium-hard cue tip is very consistent with a lot of control. Dynamite multi-layer cue tips are made out of five layers of pig leather and treated to a specific hardness naturally. Laminated with the VACULAM™ process, Dynamite cue tips are the best priced laminated cue tips for both their quality and durability. 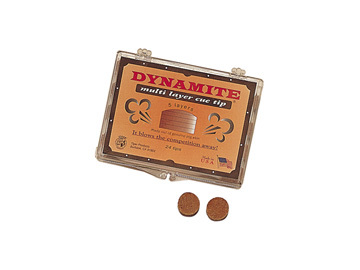 When you play with a Dynamite multi-layer cue tip, it blows the competition away.